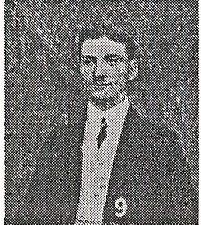 Home / Posts Tagged "WW1 Research Ireland"
Local Cavan man David Carson Jones was born in 1887 at Cloverhill, County Cavan. He enlisted in the 1st Battalion Royal Irish Fusiliers in April 1907, being promoted Lance Corporal the same year. 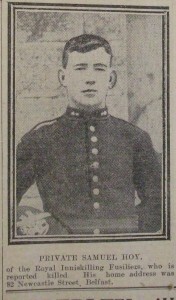 He was promoted Corporal in 1909 and Sergeant in 1913. 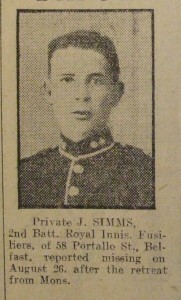 In addition he had attained the 1st Class Education Certificate, which marked him as a soldier with a promising future. On 17th October 1914, Sergeant Jones would perform an act of bravery that would see him awarded the Distinguished Service Medal for gallantry in the field in the face of the enemy. Like many other regular Irish Regiments, the Royal Irish Fusiliers were first into the fray at the beginning of the First World War. As part of 10 Brigade of the 4th Division of the British Expeditionary Force, (BEF), the Faugh-a-Ballaghs went from peacetime duties to the front line in around two weeks. Arriving in Boulogne on 22 August aboard the SS Lake Michigan, a Canadian Pacific Steamship Company passenger and cargo steamer, the Fusiliers had little time to rest before engaging the Germans at the battle of Le Cateau, France on 26 August. In what was a fairly confused engagement owing to difficulties with communications, the Fusiliers suffered 24 fatalities including two Cavan men. They were 21-year-old Joseph Sullivan, son of Michael and Bridget Sullivan of 6 Breffni Terrace, Cavan and 24-year-old Private Peter McNally, son of Francis and Kate McNally of Cootehill. The Faughs then joined the strategic withdrawal of the BEF which saw the battalion engaged in fighting a rear-guard action which lasted until 6 September 1914. Involvement in both the battles of the Marne and the Aisne followed, and by mid-October the battalion, although battle hardened had sustained 43 fatalities, and many more wounded. On 17 October the Royal Irish Fusiliers found themselves on the outskirts of the town in northern France popularised by the risqué soldier’s song of the time – ‘Mademoiselle from Armentieres’. On the morning of 17 October, the battalion crossed the River Lys and advanced into the town, being met by ecstatic civilians who pressed bread, fruit, flowers and chocolate on the men. However, the Germans in the town commenced firing as they were forced to withdraw, and street to street fighting took place until around noon, when the bulk of the Germans had been forced out. On the battalion’s approach to the town was a farm occupied by the Germans. Named the Ferme Phillipeaux, an initial attack by the Faugh’s C Company was repulsed, resulting in the death of a popular officer – Captain Miles Carberry, a veteran of the South African War, and leaving several men wounded around the farm buildings. The farm was surrounded and picketed as the attack on the town took priority. Repeated attempts to encourage the Germans in the farm to surrender fell on deaf ears, and they continued to open fire on anyone who approached, killing two Fusiliers who were attempting to rescue the wounded. Orders were given to blow up the farm, and it was set on fire, but this endangered the wounded Fusiliers who were in mortal danger from falling debris. Unfortunately Jones did not live to receive his medal. He succumbed to his wounds on 20 October 1914 and is buried in Cite Bonjean Military Cemetery, Armentieres. 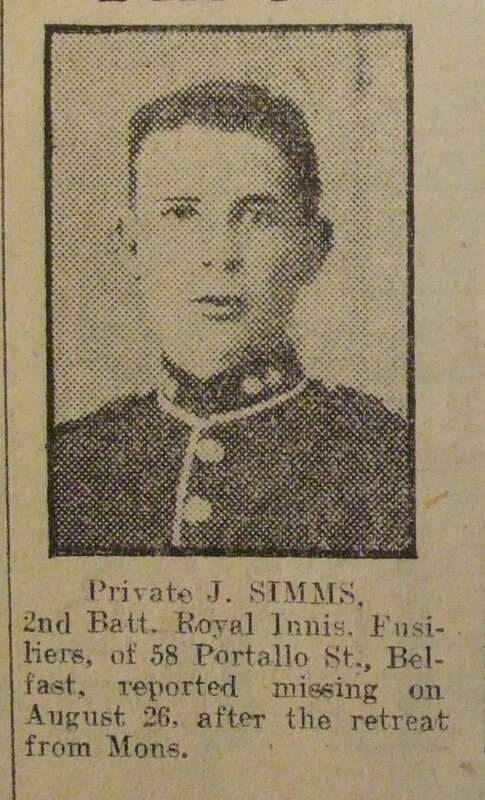 Another Cavan soldier from Sergeant Jones’ C Company died the same day from wounds in all probability received in the same action. Private John Sullivan, 21 years old, was from Creighan Terrace in Cavan town. 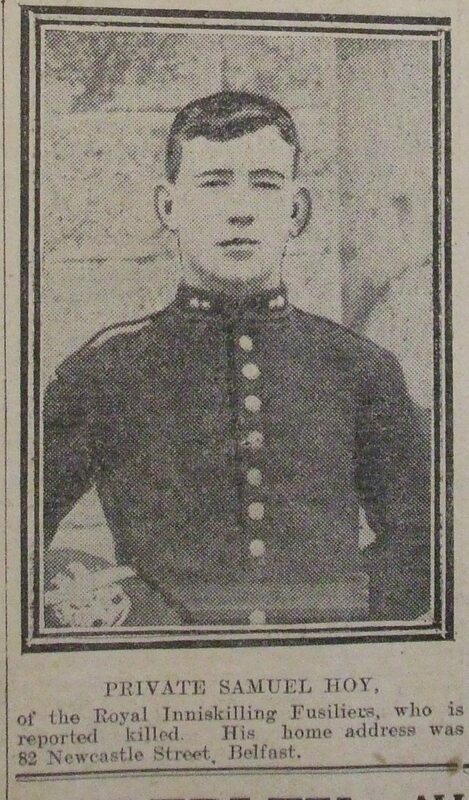 The third son of John and Lizzie Sullivan, he died on an ambulance train which was removing him to a Base Hospital away from the front line. He is buried at Hazebrouck Military Cemetery, with his parents adding the inscription, ‘Son of John Sullivan of Cavan – May he Rest in Peace’ to his headstone. Thanks to Jonathan Maguire, Royal Irish Fusiliers Museum, Armagh, for his assistance in researching this article.